Altair is around 1.8 x the mass of the Sun, but it rotates very quickly. Where the equator on the Sun takes around 25 days to complete one revolution, the Equator on Altair does one rotation ever 9 hours, a speed of 286Km/sec. This is around 72% of the speed necessary for the break up of the star. This very fast rotation flattens out the star, causing the equatorial diameter to be 20% larger than the polar diameter! This also cools the star at the equator ( search the net for 'gravity darkening' ). 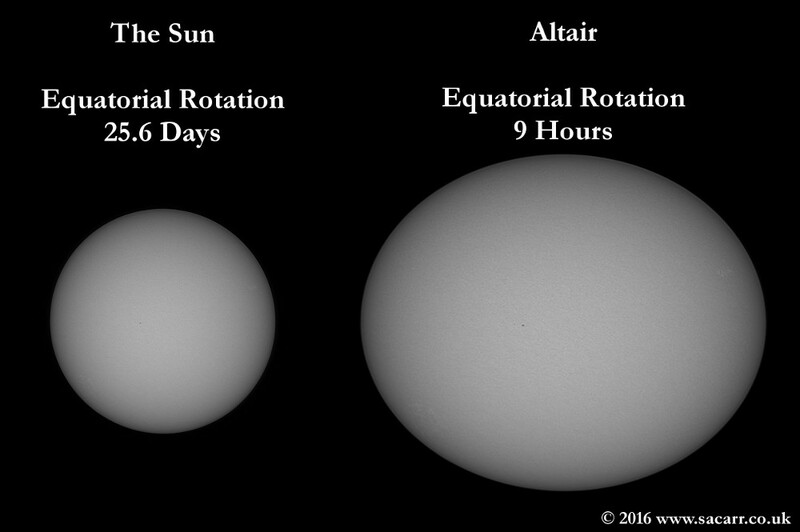 I used my Sun shot from November 1st, and enlarged and distorted it to create a comparison between our Sun and Altair to show the difference. Wiki says the radius is 1.63 to 2.03 x the Sun's radius, so I've gone for half way between for my example.